Posted on October 19, 2014	by Katy K.
Halfway through reading this book aloud to my son (423 pages, thank you very much), I read on Melissa of Book Nut listed this book as one of her favorite audiobooks… d’oh! We now own it on audio, and my love reports that he’s enjoying it very much. I’d initially brought this book home to read for myself because the Old School Wednesdays review on the Book Smugglers reminded me that I’d wanted to read it for a while, and with the movie coming out next year, I thought I should read it before it got hold lists on it. I should note that it also won the Middle Grade Science Fiction and Fantasy Cybils award when it was first published. The story is framed as a school report. 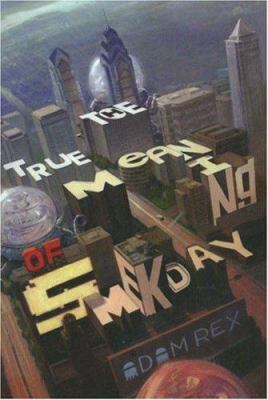 Gratuity Tucci – Tip to her friends – is supposed to write an essay on what Smekday means to her. It starts out really short, with her memories of the day the alien Boov first invaded. But as her teacher repeatedly tells her she can do better, her essays get longer and longer, including both her sketches and drawn photographs of the events. Tip watches her mother get sucked up into the Smek ship and sets out in her mother’s car with their crotchety cat to find her – eventually accompanied by one of the invading Boov himself. J. Lo, as he’s decided his English name should be, has gotten in trouble with the rest of the Boov. She consents because J. Lo transforms the car so it can fly, which is necessary since most of the roads have been bombed out. Along the way, they visit the magical Happy Mouse Kingdom and Roswell. Tip is still working on ways to get rid of the Boov when another batch of alien invaders turns up, aliens who make the Boov look sweet and kind for leaving Americans a single state to live in. There is so much wonderful going on in this book – where to start? There’s Tip herself, a human girl of mixed African and European ancestry, very self-aware and unwilling to let anyone’s ideas about what these things should mean about her get in the way of what doing what she feels needs to be done. There’s J.Lo, who starts out annoying and grows on the reader much as he does on J.Lo. The adventure is absorbing, the details both of the invasion and Boov history and culture well done, and all the while this is going on, we the readers and Tip are uncomfortably aware that the alien invasion and treatment of humans isn’t really much different than any number of things that humans have done to each other. If that starts to sound like it might be too heavy, it’s not, because it’s handled so well and with so much humor that we were laughing out loud every time we read the book together. Hilarious writing, good action, with real characters and Deep Thoughts. This is what a great children’s book should be. Well done, Adam Rex, and the 2007 Cybils Award committee. This entry was posted in Books and tagged African-American, aliens, diversity, youth science fiction. Bookmark the permalink. That does sound hilarious! Bahni Turpin did a great job with The Mighty Miss Malone, which we listened to earlier this year – and this book has even more scope for creative reading! My son was already noticing things in the preview that were missing from the book! I haven’t done the audiobook yet – I read it aloud all the way through – but my love listened to it and enjoyed it, and my son will likely listen to it repeatedly on his own.